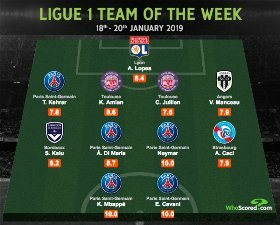 Nigeria national-teamer Samuel Kalu has been named in Whoscored.com's Team of the Week for the latest round of matches in the French Ligue 1. The Bordeaux number ten is joined in the Team of the Week by some illustrious names such as Paris Saint-Germain offensive quartet Kylian Mbappé, Neymar, ángel Di María and Edinson Cavani. Kalu occupied the right wing in a 4-4-2 formation, with RC Strasbourg's Anthony Caci deployed as the left midfielder. The 21-year-old earned a place in the Team of the Week after inspiring Bordeaux to a 1-0 win against Dijon on match day 21 and the highlight of his performance was the game-winning assist he produced in the 77th minute. Kalu showed off his shooting skills with a game high five shots of which two were on target and recorded four successful take-ons, more than anyone else on the pitch. In other stats, the former Gent star made one key pass, was fouled twice and registered two interceptions and two tackles. He got a rating of 8.24 for his efforts against Dijon.